Dogs have always been an important part of my life. I have been training and competing with my own dogs for 20 years. 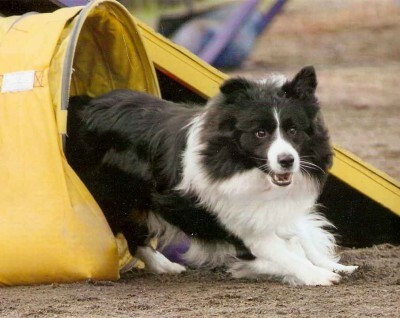 I currently train and compete with my Border Collies in agility, conformation, dock dogs, herding and obedience. 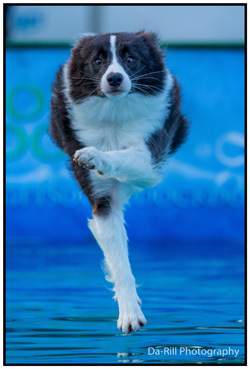 In 2012, we heard that a dog pool in Vancouver was available for lease. Emily and I felt it was the perfect opportunity for us to start a family business and Dogs Gone Swimming Wellness Center was created. I received swim coach training in 2012 from the founder of The Rex Center in Pacifica, CA, as well as from several local individuals. In September 2014 we moved our business from Vancouver, WA to our current location in SW Portland, OR. In April/May of 2016 I furthered my training and earned my Certificate in Canine Hydrotherapy awarded by Greyfriars. I have worked with dogs of all ages, breeds and abilities. I have found that my background in training dogs and my calm, quiet nature helps me create a positive swimming experience for dogs of all personalities. I love that there is always a positive progression with every dog, whether they are coming to learn to swim for fun, or are recovering from a serious injury or surgery. I have always wanted to help animals, big or small. My background includes being a dog breeder, retired professional handler, trainer, rescuer, and now an AKC judge. My desire was to find a way to help animals maintain healthy lives. In 2005, I met Patricia Kortekaas, PT of Full Spectrum Therapy. She started opening my eyes to a manual therapy technique that started helping our dogs health and physical well being. I saw miracles of healing happen in front of my eyes. It wasn’t until 2008 that I discovered, through the help of Jean Pierson, PT, that I had the talent to become a healer like Patricia and Jean. To turn my desire into a reality, I went to massage school to become an LMP and then to animal massage school to get my qualifications as a certified small animal massage practitioner or SAMP. I have taken classes through Patricia to learn her technique and also am starting to broaden my abilities by seeking out other techniques to help animals heal and be healthy. My goal in life is to help an animal feel the best they can. Whether it is strictly for maintenance or helping them to heal from an injury or chronic illness. I am always learning and feel that the more tools I am blessed with, the more opportunities will unfold. *Massage is a compliment to, not a replacement for, veterinary care. Massage practitioners do not diagnose or treat illnesses or perform spinal manipulations.